The Mill House - previously known as Aberlash House - at Sonning is a Grade II listed building, built in the 17th Century. It was, however, largely remodelled early the following century, with the addition of a handsome Georgian facade. At this time, the house, along with the adjoining mill, was owned by the well-known Rich family, Lords of the Manor of Sonning. Some of the family may have lived there, for the miller, Robert Woodroffe, is thought to have inhabited the house in the village later known as 'The Rookery'. Shortly after 1797, the mill-house became the residence of the new mill owner, Mr. Daniel May. It was a fine home for this young gentleman and his rapidly expanding family. From here, he ran a successful business comprising of both the mill and a farm covering a hundred acres. Later, it was sold to the renowned Witherington family who ran the mill and lived at the ten-bedroom house, with six domestic servants, from 1852 to 1912. 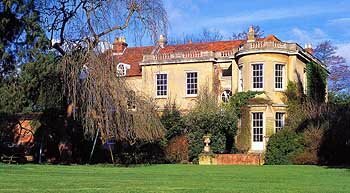 In the latter year, the property was purchased by Godfrey, third son of Sir Walter Phillimore. Constructed of Bath Stone under a tile roof with stone balustrading, the front elevation of the house is of symmetrical proportions, with a square plan entrance of paired Doric columns. The principal reception rooms are of elegant proportions and of particular note is the drawing room. Centred on an attractive marble fireplace, it has a magnificent half circular bow window with views over the gardens and grounds to the River Thames beyond. The gardens and grounds provide a tranquil setting for the house, surrounded by the River Thames, and studded with mature trees. In spring the grounds include a spectacular display of spring bulbs, whilst a magnificent Magnolia walk leads from the house towards the sluice.